Have anyone on your list who loves vintage & re-purposed items? Then this is the perfect gift to give! On a recent thrifting trip, I found a few items with a vintage vibe, that I thought would group nicely into a present for a friend … and had seen a few gift ideas on Pinterest that were wrapped neatly using a button down shirt, so I decided to give it a try! 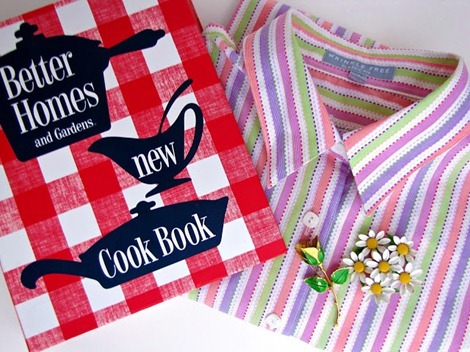 A Better Homes & Gardens “new” old cookbook, vintage pins and a bright button down shirt that can be re-purposed into another project … I love the print! Start by ironing any wrinkles out of the shirt, then lay it face down on a large surface so you have lots of room to work. 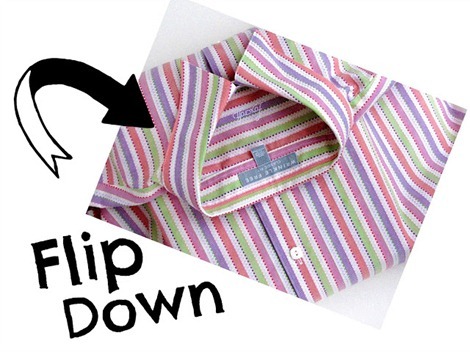 Place the book in the middle and flip the bottom half of the shirt up so the buttons are facing you. 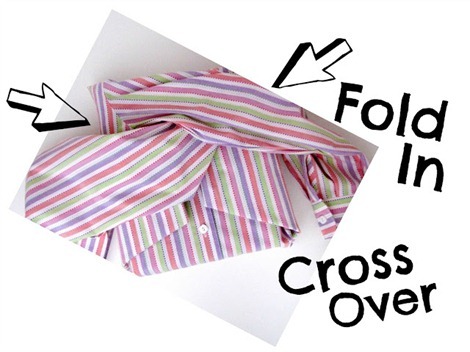 Now fold the top half of the shirt down over the bottom half, so you’re left with the sleeves sticking straight out on each side. Fold the sides in towards the middle and cross the arms over each other … so one is over and one under … the sleeves should end up a little more towards the top of the book. When folding the sides in, imagine you are wrapping a present, some creasing and tucking is needed to get it just so. 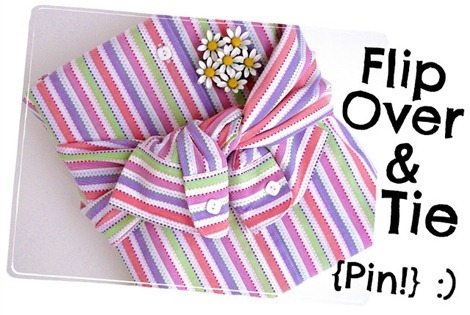 Flip it over to the front and tightly pull the sleeves down and towards the center of the gift, positioning the cuffs over the row of buttons. 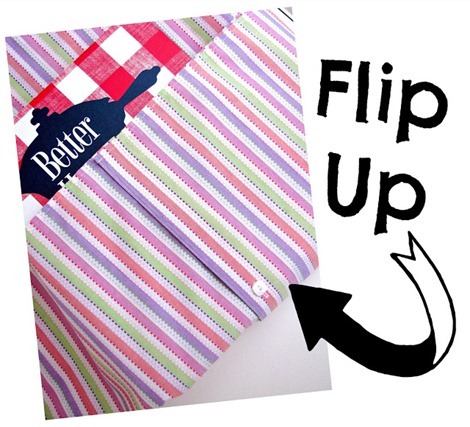 Fold over and use a safety pin to secure if needed. On goes that pretty pin and Ta-Da! You have a unique and easy to assemble gift! 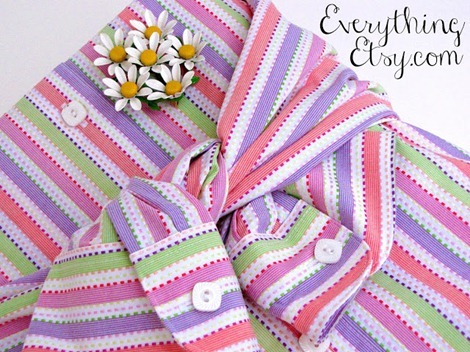 She’s a super talented contributor to Everything Etsy! You can find out more about Jaime on her blog…Raising Up Rubies or vist her Etsy Shop. 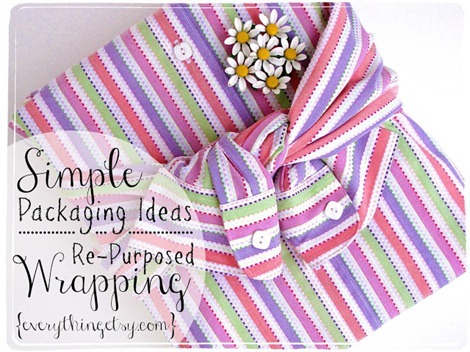 Do you have any creative packaging ideas to share? I’d love to hear about them! Just like a furoshiki, very nice! What a wonderful idea! The yellow rose pin brought back so many memories… when I was a girl I had a red rose pin just like it! Have a great day! And thank you for sharing! So cute and clever, Jaime! That is so adorable, & no one would ever guess what the present was!